I Started 4x4outfar.com for Overlanding and learning better 4×4’ing to get out of the office and home. Get back to the places I grew up and remember what it is like not doing the same thing every weekend. It’s great getting the family out for fresh air and braai’s with bonfires in the evening. Or just enjoying the hot springs in Namibia or any of the other areas they pop up. Follow 4x4outfar.com on this journey to learn, explore and escape the city and bring us closer to fun in the sun..
4x4outfar.com will be looking at product reviews, Overlanding journeys, Usable content and tents, camp sites and other peoples vehicles. Nothing specific on the cards except having fun with family and friends while doing overlanding tracks. 4x4outfar.com is planning a few trips and organising products. 4x4outfar.com is developing all the time to simplify and make experiences easier. 4x4outfar.com believes 4x4ing and overlanding should be like lego. People should be able to swap, plug n play, move equipment around to best there needs at that time or due to that trip on a specific weekend right? 4x4outfar.com doesn’t believe in over complicated or difficult ways to travel. Especially since we will be out in the open and isolated area between deserts, rocks and forests. The dynamics between all that 4x4outfar.com believes it should be enjoyable and not over complicated. 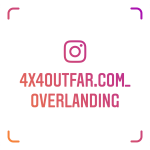 Please I ask you to join 4x4outfar.com on all adventures even if it’s through the lens of your laptop, phone or smart TV. Youtube is available for us all to enjoy and 4x4outfar.com wants you to along and guide me to what you like if the content is not to your liking and also compliment us if we get it right.. Follow Our Youtube Channel and links and be in touch.